The first settlers to make their home in West Michigan were the Native Americans. The Gun Lake Tribe, lead by Chief Match-E-Be-Nash-She-Wish, originated from the Kalamazoo Valley, their village “at the head of the Kalamazoo River”. The Gun Lake Tribe, also known as the Match-E-Be-Nash-She-Wish, were Potawatomi Indians, which are part of the Three Fires Confederacy. During this time period, many land cessions were being made and eventually the tribe relocated to the Gun Lake region, where they stayed for quite some time. In the early 1900s, the tribe tried to take the steps to become officially recognized by the state as a tribe. The Bureau of Indian Affairs declined their recognition, along with the rest of the Lower Peninsula tribes in Michigan, but later in the 1990s the Gun Lake Tribe filed once again for federal acknowledgment. On August 23, 1999 Chief Match-E-Be-Nash-She-Wish and his tribe were granted their wish and were finally considered an official Native American Tribe. 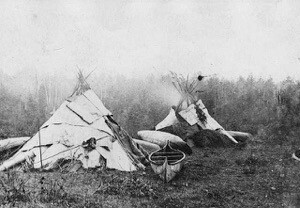 The Gun Lake area still has a Native American presence to this day, with the Bradley Mission being the main place of interest for the tribe.